Happy Friday! Thinking about getting your holiday decorations up this weekend? I’ve got some inspiration for you! This year, I’m personally tempted to create a Winter White Holiday theme at home! However, seeing that we just purchased our lit up Christmas tree last year, I doubt the Mr. would have appetite for a second white Christmas Tree. A girl can only dream! Don’t let my girl problems stop you though! If you’re considering an airy, white-filled inspired look for your home this holiday season, RONA has some amazing picks for you. 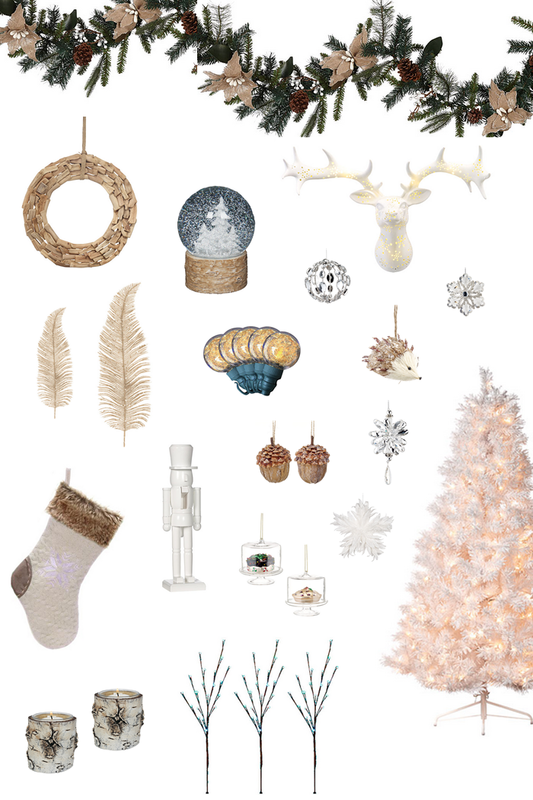 Everything you see in my mood board is from RONA, prices are crazy affordable and there are over 600 items in their holiday collection. I am totally swooning over those mini cake stand ornaments (back in stock soon), how cute are they? I also managed to get my hands on a few birch wood candle holders, be sure to stay tuned to see what simple table centerpiece I end up DIY-ing with them! Best of luck to the start of your holiday decor season! Can’t wait to see what you all come up with! Have a fabulous weekend!